Tennis Elbow Symptoms: What Are They? - Jeffrey H. Berg, M.D. 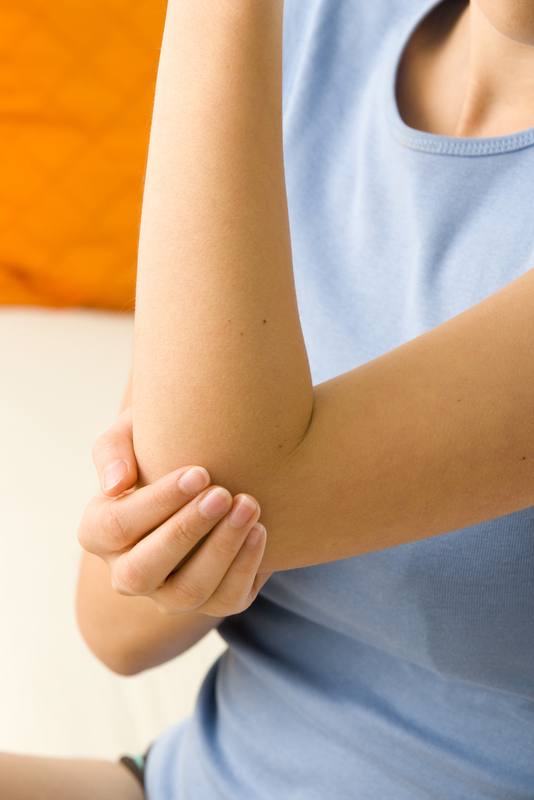 Tennis elbow symptoms are a very common cause of doctor’s office visits. In fact, tennis elbow is the number one most common elbow problem. I previously discussed the anatomy and cause of tennis elbow in a prior post, but let’s briefly review here. 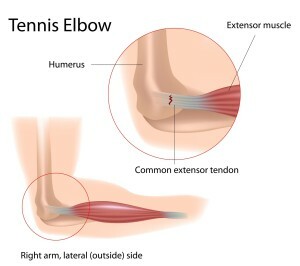 Tennis elbow is an overuse injury of the tendons on the outer side of your elbow. These tendons are responsible for extending your wrist, as when you lift your wrist toward the back of your hand. Common activities requiring this motion, and therefore these tendons, are any grasping done with your palm faced down toward the ground, such as lifting dumbbells off a rack, groceries out of a trunk or luggage from of an overhead compartment. Other frequent inciting activities are painting, digging, using hand tools and of course, playing tennis. Tennis elbow develops from usually one of two mechanisms, both “over stressing” the involved tendons. Either way the results, and the tennis elbow symptoms, are the same. Pain is the most common of the tennis elbow symptoms. It is usually the one responsible for bringing the patient into the doctor’s office. The pain is almost always located just in front of the bony prominence on the outside of your elbow. It is not uncommon for it to radiate into the back of your forearm. The pain may develop slowly or less often, rapidly as in the case following an injury in which the outside of the elbow strikes something, such as a door jam. The pain is often described as “gnawing”. In most cases, it occurs with activities involving palm down lifting or wrist extension. Many describe pain with shaking hands and when taking larger objects, such as a carton of milk, out of the refrigerator. At times the pain can occur at rest and frequently it can interfere with sleep. In some cases, the pain will be worse after resting the elbow or waking from sleep. In other cases, the pain worsens with increased activity. Often the pain is mild to moderate, but on occasion, it can be quite severe. Stiffness is a variable symptom. It is not always present. Usually, however, when present, it is mild. It often is worse after resting the elbow or after sleeping. The stiffness usually improves with elbow activity. Very rarely is there swelling of any great degree. It is not uncommon, however, to have mild swelling localized to the area of pain, on the outside of the elbow. Swelling in other areas is rare. Its presence could mean that there is a different problem altogether. Elbow or grip weakness often is present. It is not necessarily that the hand or elbow have become significantly weaker. Rather it more likely results from poor effort due to pain experienced when trying to grip firmly or bend the arm against resistance. Of all the tennis elbow symptoms, catching, clicking or popping is the least common. In fact it is so rare, that it should call into question whether something other than tennis elbow is present. Tennis elbow is an extremely common elbow problem. The physical exam and symptoms are usually diagnostic. Fortunately, this problem can almost always be treated successfully. So if you suffer from any of these common tennis elbow symptoms, it is a good idea to visit your sports medicine specialist and get your elbow evaluated.